What’s New/Best Seller • SpinLite Tunnel Wash Systems. Advantages/Features • SpinLite tunnel systems redefine tunnel car washing, setting new standards for customer appeal and wash performance. Patented LED-illuminated, color changing wash wheels attract more customers and keep them coming back with an unprecedented light show. Patented SpinMitt media is designed for low-RPM washing — gentle, quiet, and thorough — with over four times the touches of traditional equipment to deliver better than hand washed results. Service/Installation • Business planning and complete system training are available. Along with an extensive local distributor network backed by expert corporate technical support and aftermarket parts teams. Chia-Ma provides solutions for various car wash needs including belt conveyors, tunnel equipment, roll overs, prepping units, and buildings. The company specializes in full stainless steel designs and its systems are able to wash dually trucks. What’s New/Best Seller • Unattended Tunnel with Dual Belt Park System. Advantages/Features • Park Conveyor avoids all human error including turning the wheel, applying the brake, and leaving the moving conveyor earlier. These benefits make the tunnel truly unattended and ultimately safe. Systems start as short as 45’ including the loading section. MacNeil Wash Systems has provided superior car wash equipment to the tunnel, automotive, fleet, and rental markets for more than 30 years. MacNeil products are engineered to provide superior cleaning performance, reduced maintenance, increased production, maximum cost savings, and equipment longevity. What’s New/Best Seller • EVO-XR Belt Conveyor; Plug and Play Hydraulic Retrofits for Top Brush, WrapAround Brush, High Side Brush, Rocker Brush, Gloss Boss, Wheel Boss, Extra Long 9’ Gloss Boss; Final Shine BMF Drying System; Magnum Force High Pressure Arch; and WrapAround Brush 6’ RGB Light Bar. Advantages/Features • MacNeil’s express tunnel is one of the safest and most reliable in the industry. Whether upgrading an existing site or starting from the ground up, MacNeil express tunnels deliver fast return on investment at a lower total cost of ownership. All systems and components are backed by outstanding service and support from MacNeil’s worldwide network of professional distributors. 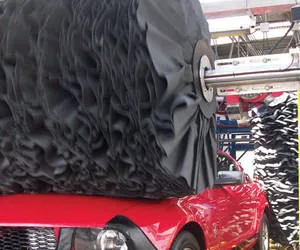 Carolina Pride Carwash Systems and Solutions has provided car wash operators throughout North America with industrial grade wash systems for more than 50 years. 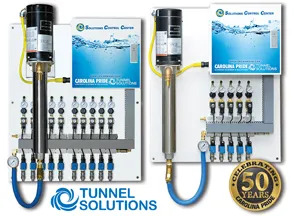 Advantages/Features • The powerhouse in the company’s Tunnel Solutions line of equipment, the Solutions Control Center (SCC) can reduce solution cost up to 20 percent and reduce water and sewer costs 15 to 20 percent. The SCC comes standard with a VFD control for the pump, providing precise solution dispensing and longer pump life. Single pump, pre-wired, re-buildable injectors, quick disconnect injectors, and an individually regulated air supply are included with the SCC. Featuring five to 10 solution services, each unit is custom built to fit specific needs and makes solution management a breeze. Several models are available to best fit the operator’s equipment needs. What’s New/Best Seller • Express Polishing Tunnel System. Advantages/Features • Sonny’s Express Polishing Tunnel System can wax, polish, and shine up to 50 cars per hour. 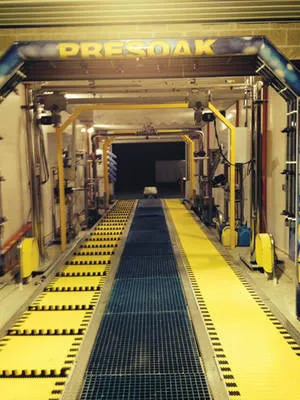 Including this additional tunnel to a car wash allows operators to reach sales levels of a flex serve without additional labor. 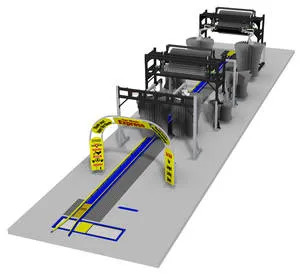 The system includes: over-under conveyor; grand entrance arch with printed panels; straight exit wrap-arounds with wick-a-way buffing material; dual counter weight top brush; side brush with cross-over arch; and Buff-n-Dry and tire seal combo. PECO Car Wash Systems is passionately committed to providing great equipment as well as the resources car wash owners need to be successful. With over 50 years of experience, PECO has earned a reputation around the world for providing high quality systems at a competitive price. What’s New/Best Seller • Customized Conveyorized Car Wash Equipment. 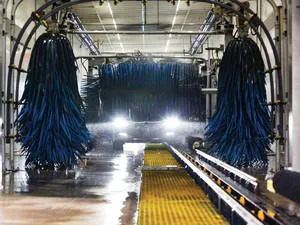 Advantages/Features • PECO Car Wash Systems combines equipment to save space and energy. Systems optimize water jet placement to conserve water and use components that are reliable and easy to maintain. PECO uses stainless steel for structural components — it’s stronger, lasts longer, and is easier to maintain. Systems utilize thicker material and oversized tubing that is strong and designed to last. Customer/Operator Support • A staff of engineers, service professionals, and a complete parts department is available. A global distributor network with hundreds of car wash professionals provides local support. Ryko is a leading full-spectrum car wash equipment, chemical, and service supplier. 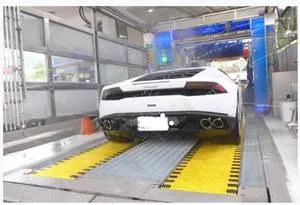 It offers state-of-the-art, automated car wash systems and a complete line of car wash chemicals specially formulated to lower the cost per wash. Its nationwide service network is staffed by factory-trained technicians to maximize car wash equipment uptime — and in turn, revenues. What’s New/Best Seller • SoftGloss Mini-Express. Advantages/Features • The SoftGloss Mini-Express Converts an underperforming in-bay automatic to a mini express tunnel in just 35’. It increases throughput, reduces water and chemical consumption, and allows operators to compete with faster moving express tunnels. Customer wait time is dramatically reduced and customer satisfaction is increased. Installation requires minimal downtime with little or no site changes. The standard package includes express conveyor, top-side combo wash, low side washer, and drying system with airflow locks. The upgraded package includes tire scrubber, tire shiner, and high pressure wheel cleaner. 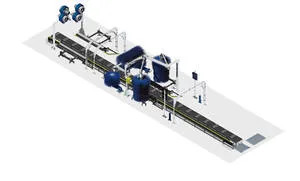 Since 1965 Coleman Hanna has manufactured a broad line of conveyor car wash equipment. The company engineers and manufactures durable, low maintenance equipment. What’s New/Best Seller • In-Bay Tunnels. Advantages/Features • Coleman Hanna’s In-Bay Tunnels can fit in most standard rollover bays and can wash up to 35 to 60 cars per hour. Utilizing the most productive combination of Hanna foam or cloth components, the system is more than twice as fast as most in-bay automatics. This speed more than doubles wash volume while reducing drive-offs, turning a rollover or self-serve bay into a true profit center. Packages are available to fit bays 28’, 35’, and 40’ in length. All three systems can be modified to suit individual needs. Motor City Wash Works Inc.
Motor City Wash Works designs and manufactures industry leading, conveyor car wash systems. Form and function, innovation, value, expectation, and customer satisfaction are key elements for all Motor City products. The company also offers thousands of parts — not only for its own equipment, but several of its competitors as well. What’s New/Best Seller • Motor City Dry N’ Shine. Advantages/Features • The patented Dry N’ Shine produces drier cars using less horsepower, reduces labor when offering manual towel dryers, increases revenue by adding a new service or package, consistently produces dry and shiny vehicles, and creates an enhanced customer experience with a quiet and gentle touch. 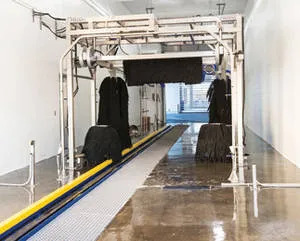 Units can be programmed to perform wash and rinse cycles in the off hours, and to increase/decrease speeds of the drying wheels based on which area of the vehicle is being dried. Customer/Operator Support • Motor City Wash Works’ nationwide network of factory trained authorized distributors and direct area operations provide customers with sales, service, parts, installation, and chemicals. Experience, quality, and attention to detail: these are the driving factors in Ultimatech’s philosophy. What’s New/Best Seller • Flex-Wrap and Dragon System (heated CTA). Advantages/Features • Ultimatech Systems are designed for cutting edge performance in cleaning power with unparalleled efficiency. 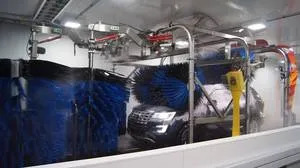 As car wash operators, the company has the knowledge, experience, and expertise to produce a clean, shiny, and dry car with the least amount of manual labor on a consistent basis. Customer/Operator Support • Support is available 24 hours a day, 365 days a year. Bronx, NY 10474. (718) 589-9300. 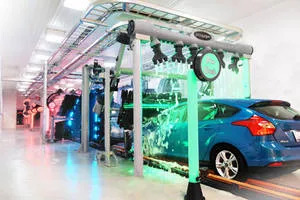 Founded over 40 years ago by Martin Geller, Vehicle Wash Systems has provided car wash equipment for both the individual car wash owner as well as custom systems for the automotive industry, truck, and bus washes. What’s New/Best Seller • Superior Flat Belt Conveyor System. Advantages/Features • The Superior Flat Belt Conveyor System is a safe and customer friendly system. It has no pinch points such as rollers, chain, or guide rail to damage wheels. The belt system can be used in a mini-tunnel or with a high pressure touch free roll-over machine.